In the 1930s, Julio Gallo established an exclusive arrangement with the Frei family, Swiss immigrants, to buy all of their grapes from vineyards in Sonoma County. 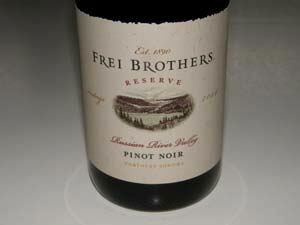 This relationship grew over the years until the E. & J. Gallo Winery bought the Frei Brothers Winery in 1978. A Pinot Noir is produced from the Russian River Valley along with several other varietals from Sonoma County. The wines are widely distributed.